From a PHUTURAMA perspective there is nothing new in Metropolis 27/10. The lost scenes, fortunately saved by an Argentinian distributor immediately after the controversial Berlin premiere of 1927, were expurgated from Fritz Lang’s original cut at least to save the commercially crucial U. S. exploitation, but it almost completely ruined Metropolis’ narrative structural integrety for decades. It is now becoming clear that the until then very chlichéd story (“The New Tower of Babel”) is primarily propelled by the fundamental clash of the two big egos of Johann “Joh” Fredersen and the inventor Rotwang who were the founders of the gigantic high-tech city of Metropolis. They split up because of their love for the same women called Hel. She tragically passed away whilst giving birth to the son of the lately victorious Joh Fredersen who had become the undisputed hegemon of the vertically integrated Great Society of Metropolis – a Fordist nightmare of class segregation. The brilliant, but finally vanquished Rotwang never overcomes his defeat and so he constructs a robotic (wo)man-machine to substitute his late beloved and idolised Hel. But it’s not Hel who is eventually becoming the matrix of the iconic Mensch-Maschine, it’s a young woman named Maria preaching the virtues of love and reconciliation to the impoverished workers in the abandoned Unterstadt catacombs. From the first accidental encounter in the Oberstadt’s elitist Forever Gardens it is this woman who Freder Fredersen – the magnat’s rebellious son and ‘mediating’ heart of the story – has fallen in love with. After Rotwang disclosures his secret surrogate of Hel to Joh Fredersen, the patriarch himself forces the inventor to alter the robot form to replicate the new girl in town, Maria, who is evidently becoming a menace to the authorities. Fredersen is intending to use Rotwang’s ingenious automaton to regain his influence over the workers and his dissident son. Rotwang assents only perfunctorily to Fredersen’s plot, aiming to execute cold revenge against the rival and to destroy his metropolitan supremacy. The ‘fake’ Maria is attended to spur the underprivileged working class on to ultimately rage against the machine. The ‘machine’ as in Herz-Maschine, epitomising the entire system, not as in Mensch-Maschine. The uprising against the latter ironically comes to pass as a consequence of the first, when both villain’s sinister ambitions happened to fail by epic proportions. This happy ending is emblematic in the context of the profoundly disturbed Weimarer Republik of the 1920s, when the Nazi regime could eventually achieve a sort of long yearned ‘compromise’ between the hand and the brain by a charismatic leader, advanced political propaganda, and brute as well as total terror – domestically and abroad. 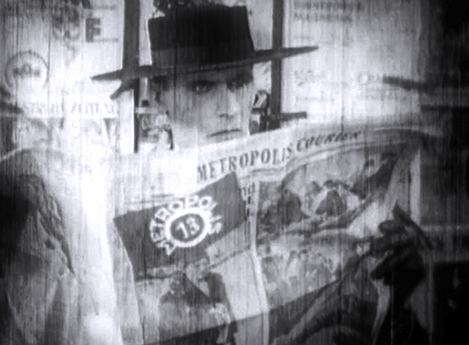 Metropolis prophetically envisioned the Holocaust avant la lettre in the hallucinatory sequence of the illuminated Freder Fredersen when he is confronted for the first time with the exploited workers’ misery at the central Herz-Maschine which then mutates for him into a giant man-eating Moloch of industrial mass-destruction. There are lots of fascinating motifs of religious thought and tradition which make Metropolis’ intention look very alt-fränkisch and sceptically anti-modernist in contrast to the prevailing ultra-futuristic commonplaces like man-machine interfaces, video-phones and mile-high towers in the skies. So, beyond its iconic and paradigmatic visual as well as cinematographic qualities, Metropolis 27/10, in its reconstructed narrative, becomes an important historic witness to the unique and fatal Anti-Western mental state of Germany’s pre-Third-Reich society.